A seamless, top down bell shaped cardigan with eyelet and ruffle accents, ¾ length sleeves, and several opportunities to play with color. Yarn: Worsted to aran weight yarns that knit to gauge. 175(205, 235, 250) yd [160(190, 215, 230) m] of main color and 110(125, 140, 155) yd [100(115, 130, 142) m] contrasting color. 15 yd [14 m] of scrap yarn for button band. Needles: Size 8 US [5 mm] needles and a set of double-pointed needles in the same size, or whatever size you need to get gauge. on ravelry here. 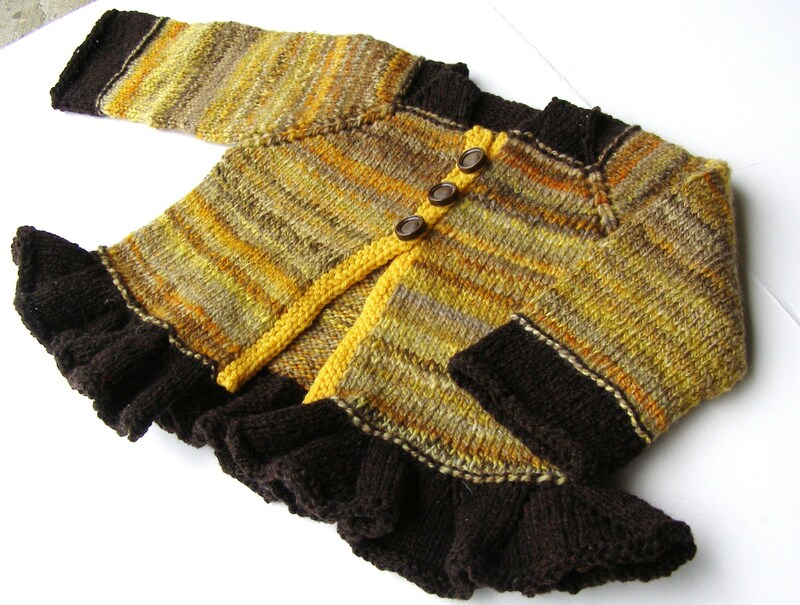 this pattern is also available with the baby belle, baby beau, and belle sweaters in the beautiful baby bundle ebook and with other handspun designs in the mixed knits ebook. 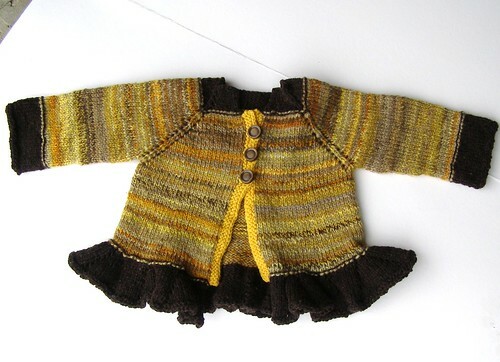 This entry was posted in baby, cosyknitsliterally, cosyspins, handspun, knitting, patterns, spinning, sweaters by cosymakes. Bookmark the permalink.